If you like Egg Foo Yung in restaurants, this Chicken Egg Foo Yung with Mushrooms and Green Onions is a delicious version to make at home. And this recipe is low-carb and it can be gluten-free if you make sure to use gluten-free oyster sauce. Use the Diet-Type Index to find more recipes like this one! 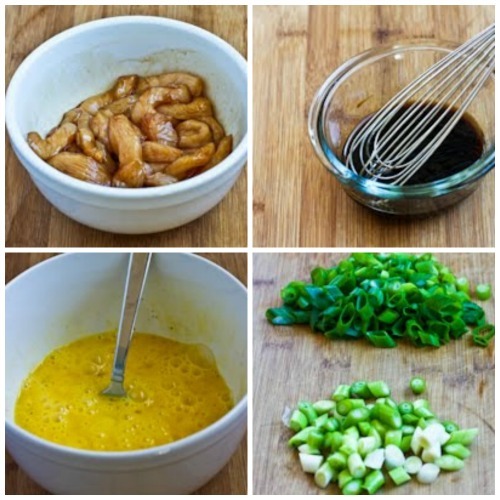 Click here to PIN Chicken Egg Foo Yung with Mushrooms and Green Onions! In 2001 I went to Hong Kong and Beijing with my brother Rand, and it didn’t take long to realize that most of what we consider to be “Chinese food” in the U.S. is definitely Chinese-American food. I know Egg Foo Yung is one of those dishes that falls in the Chinese-American category, and although it doesn’t get much respect compared to more exotic items you find on menus, it can be one of my favorites when it’s made well. I learned to love Egg Foo Yung at The Pagoda, a now-closed Chinese American Restaurant in Salt Lake with a Japanese name! My family went there for special occasions, and I remember eating Egg Foo Yung at the Pagoda as a reward for making the honor roll in high school. In all the years since then, I don’t think I’ve thought of making Egg Foo Yung myself until I saw this Chicken Egg Foo Yung with Mushrooms and Green Onions from Fine Cooking. Their version was a little different than the dish I learned to like as a teenager but equally delicious, and if you like Egg Foo Yung, you should try this recipe right away! Cut chicken into strips and marinate in sesame oil and soy sauce. Whisk together oyster sauce, white vinegar, soy sauce and sesame oil. Beat eggs with salt and pepper and sesame oil. Clean green onions, then slice on the diagonal and separate dark green pieces from white/light green pieces. If needed, wash and slice mushrooms. Heat 1 T oil in a 10 inch frying pan, add chicken and cook until it’s cooked but not browned, then transfer to a plate. Heat another T oil, then cook white/light green pieces of green onion about 1 minute. Add mushrooms and cook 4-5 minutes, until mushrooms are softened and give up some liquid. 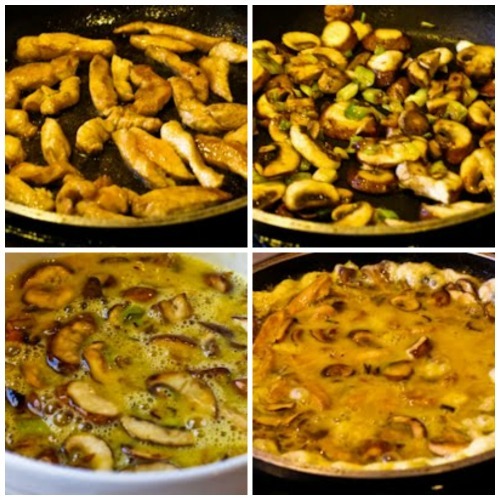 Stir chicken, green onions and mushrooms into the eggs. Wipe out the frying pan with a paper towel, add the remaining 2 T oil and heat over high heat until the oil is shimmering, then add the egg mixture. Sides will puff up; immediately reduce heat to medium. Cook egg mixture on medium heat for 4-5 minutes, lifting up the cooked parts so the uncooked egg can run under and cook. When eggs are starting to look firm, turn heat to low, press down the mixture so it’s relatively flat, and cook 2-3 minutes more. (The center will still look slightly wet.) When eggs are cooked, remove pan from the heat, put a plate over the top, and turn it over so Egg Foo Yung is centered on the plate. (This is the hardest part, be brave!) Pour sauce mixture over the egg pancake, sprinkle with sliced green parts of green onion, and devour! If you like Egg Foo Yung in restaurants, this Chicken Egg Foo Yung with Mushrooms and Green Onions is a delicious version to make at home. Put chicken in small bowl and add 1 tsp. soy sauce and 1 tsp. sesame oil. Whisk together the Oyster Sauce (Be sure to use Gluten-Free Oyster Sauce if needed. ), white vinegar, 1 T soy sauce and 1 tsp. sesame oil, and set aside. Using a large bowl (so you can add cooked ingredients later) beat the eggs with salt, pepper, and 1 tsp sesame oil. Clean green onions, then slice on the diagonal, keeping the dark green and white/light green parts separate. Using a 10 inch frying pan, heat 1 T oil over medium-high heat, add the chicken and cook 3-4 minutes, or until chicken is cooked but not browned. Heat another T oil, then add white/light green pieces of green onion and cook about 1 minute. Add sliced mushrooms and cook 4-5 minutes, stirring a few times, until mushrooms are softened and give up some liquid. Transfer cooked vegetables and chicken to egg mixture and stir to combine. Wipe out the frying pan with a paper towel, then heat the remaining 2 T oil over high heat until the oil is shimmering, then add the egg mixture. The sides will puff up; immediately lower heat to medium. Continue to cook eggs on medium heat, using the turner to gently stir and lift the center part of the egg mixture so the uncooked egg can run under and get cooked. Cook like this about 4-5 minutes, or until eggs are starting to look firm. Pour the sauce mixture over the egg pancake, sprinkle with dark green parts of green onion, and devour! The first time I made this I had some leftovers which I kept in the fridge overnight, but I didn’t think it was that good reheated. Make as much as you can eat right away, or invite friends to finish this with you! Recipe adapted slightly from Fine Cooking. Chicken Egg Foo Yung with Mushrooms and Green Onions is a perfect main dish for any phase of the South Beach Diet, or any type of low-carb eating plan. Thanks for this! I make something similar with broccoli coleslaw and mushrooms – no chicken. It gives it a crunchy thinner texture which I love! I agree the sesame oil makes the dish. Wasn't this just the greatest, and so easy to make. So glad you liked it! Kalyn, this was FABULOUS. Thank you so much for sharing this recipe. I bookmarked it months ago when you first posted it, thinking "that's so weird that I have to try to it." (I've never heard of Egg Foo Yung) Well, I finally did make it tonight, and my husband and I both devoured it. We had to exercise a lot of self control to leave leftovers. It was EXCELLENT and so easy. I used leftover meat from a rotisserie chicken, which worked great (actually, it was what was left on my chicken after I used it to make your Quinoa Chicken & Broccoli Casserole recipe last night). Jeneen, so glad you liked it! I loved this recipe too. Kalyn, made this tonight for dinner and I have to say it was very good. Went together well too. I served it on a bed of sauted cabbage. I had 1/4, my husband had 1/2 and is taking the other 1/4 for lunch. Perfect. That's a wonderful looking dish. The distinction you make between Chinese food and Chinese-American food was interesting. Thanks for posting. Willa when we get it from our favorite Chinese restaurant it has brown gravy, but I liked this version just as much. I didn't like Egg Foo Yung as a child, but have grown to enjoy it as an adult. I like it when they put a brown gravy on it- surely NOT a chinese accent! I'll be trying this this weekend- I can't wait. Kevin, I'm guessing this would be good any time of day, but I've usually had it as part of a Chinese dinner here. This is the first that I have heard of egg foo yung and it sounds like it would make for a really tasty breakfast! Dara, it was so simple and good. I think you could also use other veggies and skip the mushrooms. 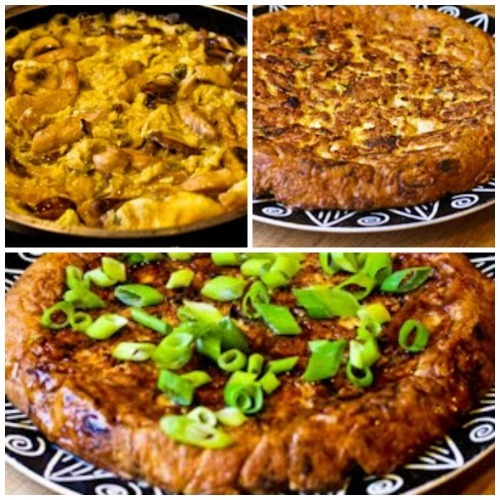 It's like a Chinese frittata – love it! I am emailing this to myself and making it the next time my husband is out of town (mushrooms are a no-go in his book). Susan, it was absolutely delish! I'm betting you would like it. I'm not sure I even like egg foo young, but after seeing your photos and reading your post, I think I do! Mei, I do think Egg Foo Yung is an authentically Chinese Dish it's just I'm not sure that this recipe for it is the way it's actually made in China! Pardon me but I thought egg foo yung is an authentically Chinese dish. Delicious looking. Lisa, that's funny! (I took piano lessons but never practiced and didn't really learn to play, duh.) This recipe was great, and I think you could use about any vegetable in it. When I was learning to play piano, one of the songs I practiced on was called "Egg Foo Young." I loved that song because it was catchy, but I never got around to trying the dish. Can't wait to make your version of it, especially as it looks so versatile! Tarrant, I think lots of restaurant versions of this dish are deep fried, so even though it's not that low in fat, this would definitely be lighter. (Love the deep fried version too though!) Sounds like an interesting book, thanks for the recommendation. That looks and sounds delicious. My mother apparently likes Egg Foo Young (even though I never remember her ordering it when I was a child) and I have been looking for a lighter version than what the place at the corner sells. By the way-you should read The Fortune Cookie Chronicles which talks about Chinese food in America vs Chinese food. Quite an interesting read, if you haven't already read it. Nettlenomad, thanks! So nice to hear you are enjoying the blog. I don't remember my my mom ever making Egg Foo Yung, lucky you! My mom used to make egg foo yung when I was a kid! I haven't had it in years, but your recipe looks delicious. Coming out the closet by commenting, but I wanted to express a little appreciation for your recipes and ideas – always so spot on and true to their ingredients..
CJ, thanks! (You too!) I do remember having bean sprouts in it when I get it in a Chinese restaurant. I love egg foo yung and missed it greatly when I moved to the town we live in now. There are Oriental restaurants, but the food left much to be desired. After several months of fighting an overwhelming craving, I decided to make it at home. It was delicious and even healthier because it was not fried in lots of oil. My recipe is very similar to yours although I like to add bean sprouts to the pan. You recipe is excellent. Thank you so much for sharing it with us. That is not at all what I expected, Kalyn! But, it looks wonderful. I'll definitely make it for us soon. RV, that's interesting. Never thought of "Indianized" extra spicy Chinese food, but I bet it's good! Trisha, I agree that SB is similar to what people eat for diabetes, although I don't know much about that diet. I'll order Egg Foo Yung sometimes when I'm on phase one for that very same reason. Michelle, that's interesting that you found a lot of Chinese-American food. We found plenty of American places like Popeyes, Outback, etc, but the Chinese food mostly seemed very authentic where we were. Joanne, agreed! I think authentic Egg Foo Yung is cut in strips, but this is delicious. It really constantly amazes me how different truly authentic Chinese food is from what we have here. A woman I worked with introduced me to real Chinese food a few years back and I was blown away. That being said, the egg foo yung looks delicious – authentic or not! My husband and I wend to China in 2004 and found that without a doubt 24 of our included meals were typically what is considered Chinese-American cuisine. There were, however, 5 included meals that were outstanding so from the food standpoint the trip was not a total waste. That being said, I am definitely going to try the recipe for Chicken Egg Foo Yung with Mushrooms and Green Onions. Miss Kalyn — keep up the great work! Chinese food that I eat here is completely different to what I ate in India and am sure it is pretty much Indianized to suit for spicy taste buds. This dish looks very interesting and would love to try it soon. Lydia, I think you'll like it; I really loved this recipe. I've been waiting for this recipe, and now I can see why you're so excited about it. I never thought about it, but TW is right, it's definitely an Asian tortilla! Thanks for the step-by-step photos that make it so easy to see how this dish comes together. TW, isn't it interesting how people cook the same foods all over the world. I will say that the sesame oil really gives this a very Asian flavor though! NSB Mom, there were quite a few steps, but it was really easy, once you read the recipe through and got them in order in your brain! This is great! I guess I really never knew exactly what Egg Foo Yung was. I'm surprised to learn that it's sort of like a Spanish Tortilla.